The art education service at the Art Centre Pasquart nurtures collaboration on different levels with various individuals and institutions to continually expand the scope of art education. 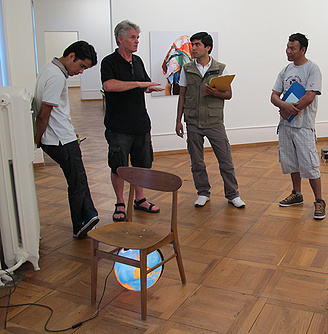 Course within the further education programme for teachers, carried out by the art education service. Performance and installation art education project by Verena Lafargue and Monica Klingler with a class of students and their teacher Lise Neher, Gymnasium Alpenstrasse Biel. Art education project for adults. Supported by pro helvetia. Project by the Master student Emilie Lopes Garcia within the partnership between the art education service Art Centre Pasquart and the study option MA Art Education, Bern University of the Arts (BUA). 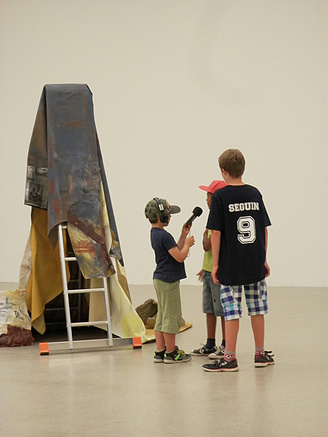 Exchange (job shadowing) and collaboration with the art education service of the National Gallery of Art Lithuania in the context of the exhibition Telling Tales (2.2.–6.4.2014). An art educator from Vilnius was a guest at the Art Centre Pasquart for three weeks.